When you look at yourself in the mirror, you can’t help but notice your crooked teeth. 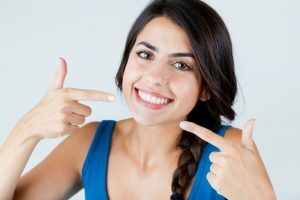 You want to straighten them, but do you go with traditional braces or with a newer technique like Invisalign? Are you a good candidate for one or both? How do you know which one is right for you? Well, you don’t have to wonder anymore or decide alone. Check out this helpful information about the options you have in cosmetic dentistry and their pros and cons. Traditional braces are a tried and true method to straighten teeth. With traditional braces, metal brackets are adhered to the front of your teeth. Wires connect the brackets and are secured using rubber bands. About every four to six weeks, the cosmetic dentist or orthodontist adjusts the wires to create the tension that steadily moves your teeth into place. Almost all orthodontists offer traditional braces. Braces may be the best option for patients who are at risk of not following instructions. Colorful rubber bands allow for a customized look. For some patients, braces are the most cost-effective option. Patients with severely crooked teeth can still be helped with braces. Metal brackets and wires are highly visible. Patients who have pre-existing gum or dental health problems may not be good candidates. The metal brackets and wires come with a list of restricted food. The wire can pop off, requiring extra visits and potentially causing pain. Dental hygiene is more difficult, requiring threading through brackets to keep them clean. If the patient plays sports, they would need a special mouthguard to accommodate the metal brackets. Invisalign has been available to the public for almost 20 years now and has proven its effectiveness. Based on impressions of your teeth, your Invisalign clear aligners are custom made and follow your unique treatment plan. About every two weeks, you put in the next tray, bringing you one step closer to straight teeth. For best results, you should wear the clear aligners for 20 to 22 hours a day. The clear aligners are barely noticeable when worn and don’t interfere with speech. The trays are removable for eating, flossing, brushing, and playing sports. Good dental health is easier to maintain. For many patients, the cost is comparable to traditional braces. The aligners are easy to keep clean, requiring only gentle brushing and rinsing every night. Patients experience fewer emergency appointments because there are no wires. Most patients reach their final results within 18 months, whereas traditional braces can take between 24 and 36 months. If the patient removes the tray too often, treatment can take longer. If trays are lost or misplaced, replacement trays increase the cost. Patients who have severely crooked teeth may not be good candidates. For some patients, the cost of Invisalign is higher than the cost of traditional braces. Now that you know the pros and cons to the two main teeth straightening options, you can make a more informed decision. However, to know whether Invisalign or traditional braces are right for you and your lifestyle, you need to talk to your cosmetic dentist. Together you can determine which option will help you achieve the straight teeth and confident smile you’ve always wanted. Schedule your consultation with your dentist today! With five dentists on their staff, Lake Oconee Dentistry offers patients services ranging from routine preventive dental care to cosmetic dentistry to sedation dentistry to dental implants. Using surveys, they welcome feedback from each patient and continually improve the way they care for patients. You can contact them by calling or clicking here.